Abbott proudly offers after-school sports and as an enrichment opportunity designed to build strength in body, mind and character. 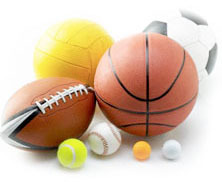 As a public school, all students are invited to try out for a sport at no cost. Academic and behavior standards must be maintained to continue participation in an after-school sport. It is an honor to represent Abbott as an athlete in our community and so students, parents and coaches must remember to wear the green and white with pride. Click on the link below to purchase Abbott gear and proudly support your Falcons!!! Abbott competes against middle schools in the San Mateo Foster City School District as well as others in the peninsula area. We are a member of the Art Davis Athletic League (ADAL) which serves schools from San Mateo to Palo Alto. Specific rules, schedules and standings can be found at the ADAL website: teamsideline.com/adal. To participate in a sport at Abbott, students must first complete the proper paperwork. Students may pick it up from their PE teacher or download it here from the website. Students must maintain satisfactory grades, a 2.0 GPA, as well as behavior. Because the league includes schools from throughout the peninsula, there may be games and practices over vacation! If you commit to a team, you are expected to participate fully. If playing and practicing over intersession is going to be a problem, please talk to the coach before hand. To find out details about specific sports, please contact the coach or Athletic Director. Tryouts August. Competition September – October. The event will be on held in the Abbott gym on Tuesday, November 13th, from 5:30-6:30pm. Tryouts October. Competition November – December. Tryouts January. Competition February – March. Tryouts March. Competition April – May. ** Teams supported at all SMFC S Middle Schools (Abbott, Bayside S.T.E.M., Borel, Bowditch) through the S.P.O.R.T. non-profit. Additional teams may be created based on need and interest and are known as Club Sports. Want to start another sport that you don’t see on the list? Contact the Athletic Director for more information. Have questions that you need answers to? Please contact the Abbott PTA Sport Liaison: Jennafer Carson at jalcarson@stanfordalumni.org .